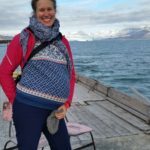 As a practicing Lutheran and Sunday School teacher at the Bergen Cathedral, I yearned also for some spiritual refreshment and was very curious to visit the Svalbard Church, a 10 minute walk up the hill from our REGIMES apartment. My flight back to Bergen (via Tromsø and Oslo) was at 2pm, and church in Norway starts at 11.00am. Perfect timing. 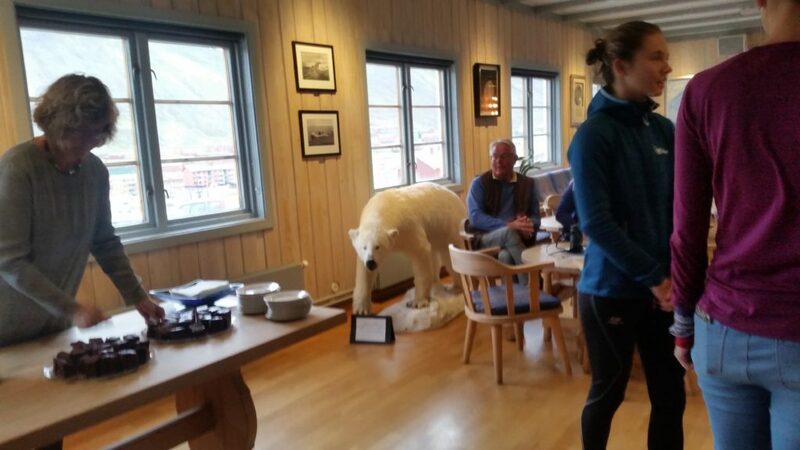 As the tradition all over in Svalbard, one removes their shoes upon entering. In the foyer, there were dozens of Crocs/plastic sandals that visitors could borrow. Finding none my size, I decided that carefully walking in oversized Crocs was better then squeezing into a children’s size. I hung up my jacket and ascended the stairs which lead to the to the adjacent main church building. “Wow” I thought. Both my seemingly unconnected career/work and spiritual worlds suddenly were spliced into one sombre realization: The climate is changing and we are guilty. 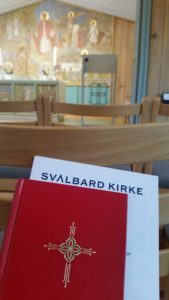 Svalbard Church is part of the Norwegian State Church, so such strong conviction in an Opening Prayer can definitely be seen as a consensus message to the country. 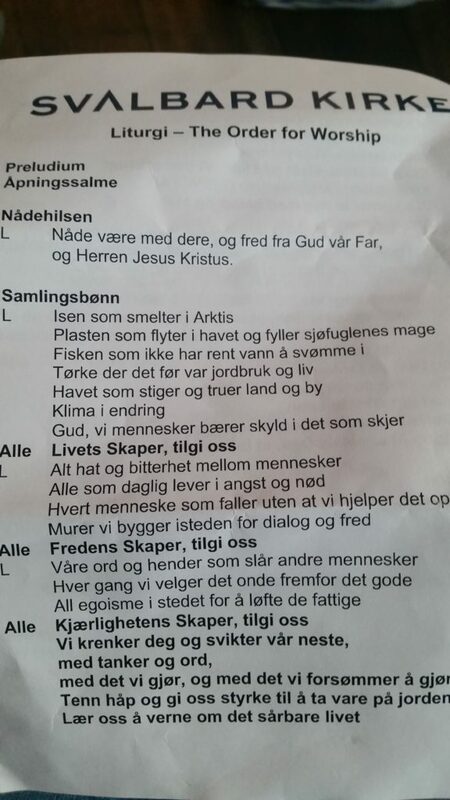 (And, even more so, this same Opening Prayer was used the next Sunday, August 20, 2017, broadcast live on NRK P1, the national state-run main radio channel.) As an American, it is even more sobering to think that in this Christian congregational prayer, there’s no escape in even entertaining a fleeting thought of climate denial. Even though the climate changes naturally, humans are guilty of destroying the world, also by artificially altering the natural climate fluxes. Please forgive us. It took me a while, but the sudden rush of “I’m now at work/I need to take notes/I need to put on my analytical thinking cap” was soon soothed by a sense of accomplishment. We in REGIMES have already recognized that anthropogenic forces, both directly on Nature such as pollution in the Ocean or over-exploitation of renewable (ex: fish, crab) and non-renewable resources (ex: minerals, oil and gas), as well as indirect forces regarding national, international and geo-political policies and regimes have a negative effect on the natural system. We recognized this from empirical data. And we have acted accordingly by dedicating parts of our career to this very important topic. One of the reasons to include our student group with us on our trip to Svalbard was to bring an inter-generational perspective to these challenges, which cannot be solved by one generation alone. Our very way of being (flying airplanes to Svalbard from all parts of the world, driving diesel cars and busses to our hotels, burning coal to take hot showers) is affecting the ecosystem services we have taken for granted. And the biggest climate-losers are not us in Northern Europe or North America, but likely those who have contributed least to CO2 emissions and pollution. By including a younger, and older generation (through collaboration with the Grandparents Climate Campaign/Besteforeldrenes Klima Aksjon) in our REGIMES project, we feel that we are well-placed to draft new ideas towards solutions in local and national politics that are informed by coupled economic-political-biological-climate model predictions and inter-generational dialogue. That is our goal. And then my day of rest settled upon me. ALL: Teach us how to protect the vulnerable life around us. God commands that we must be good stewards of His creation. Thank you, Dolly and Terry! A wonderful reminder of our awesome responsibility. Beautifully written, and I will pray that your goals become reality. Wow! It truly inspires me to see such a widespread acceptance of responsibility for our role in the health of this planet. Although I am often saddened by other communities stubborn refusal to acknowledge or care about the fate of this planet, in a strange way it gives me hope to learn that in some places they’re already asking for forgiveness.